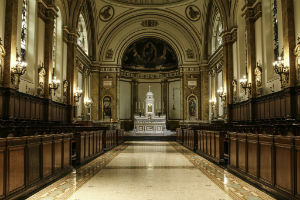 HIS MARCH, St. Joseph’s Seminary (Dunwoodie) in Yonkers will host a chant conference entitled, “Gregorian Chant in Pastoral Ministry and Religious Education.” We announced the preliminary details of this gathering back in September (here), but a number of new pieces of information have recently been released. First, I am pleased to say that I will be among the presenters at this conference. My topic will be Is Beauty Subjective? Identifying the Criteria of Beauty. In this presentation, I hope to explore the notion of beauty as a Transcendental property with an objective basis. The three keynote speakers will include Fr. Robert Skeris, Fr. Christopher Smith, and Mark Langley. A full list of speakers, topics, biographies, and lecture abstracts is now available via the conference website. The format of conference will further include panel discussions, concerts, and liturgies featuring distinguished children’s and parish choirs. Registration is now open for this event, to be held Friday and Saturday, March 10 & 11, 2017. Plan to participate in this pastoral summit on Gregorian chant!